Dan Able Kimball was born in Saint Louis, Missouri, on 1 March 1896. He was an Army Air Service pilot during the First World War and maintained an intense interest in aviation thereafter. Beginning in 1920, he was employed by the General Tire and Rubber Company, rising to Vice President of that firm in 1942. He subsequently was an executive of the rocket engine producer Aerojet Engineering Company, a division of General Tire. 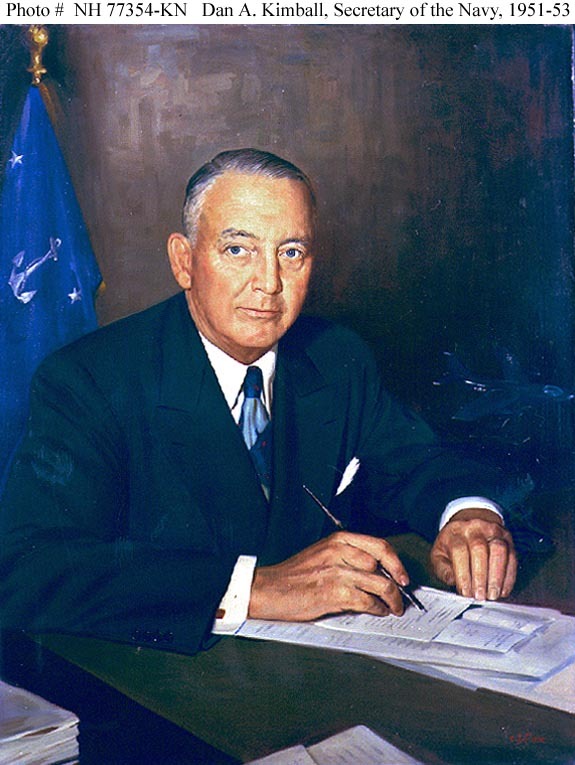 He was appointed Assistant Secretary of the Navy for Air in February 1949 and became Under Secretary of the Navy the following May. Mr. Kimball assumed the post of Secretary of the Navy in July 1951 and held that position until the end of the Truman Administration in January 1953. His tenure was marked by the continuation of the Korean War, the resulting expansion of the Nation's defense establishment and considerable technological progress in aviation, naval engineering and other defense-related fields. Returning to business after leaving office, he was President and later Chairman of the Board of the Aerojet General Corporation until 1969. He died on 30 July 1970 and was buried with full military honors in Section 5 of Arlington National Cemetery. 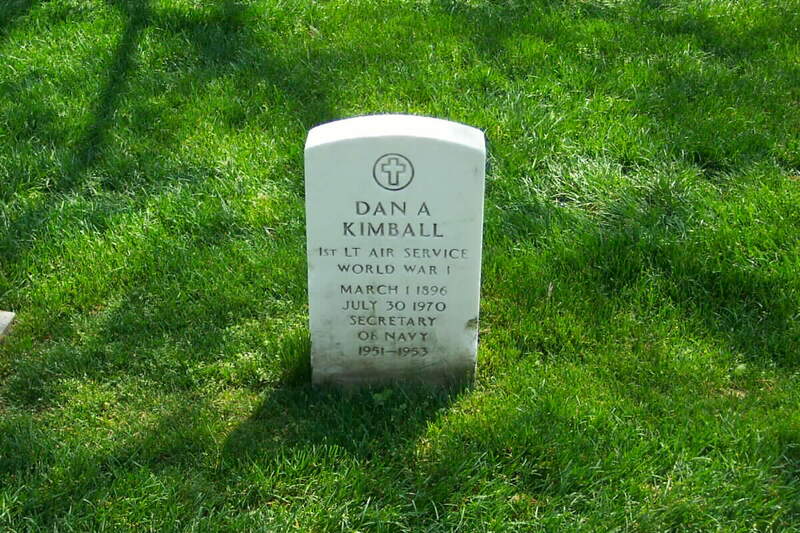 WASHINGTON, July 30, 1970 – Dan A. Kimball, a World War I pilot with Jimmy Doolittle, who went on to become Secretary of the Navy in the Truman Administration, died today at the age of 74. A spokesman said Mr. Kimball, recently retired head of the Aerojet General Corporation, had entered Georgetown University Hospital Sunday with internal bleeding of the gastrointestinal tract. The cause of death is still to be determined. Mr. Kimball, who married Doris Fleeson, the former syndicated columnist, had homes both here and at Palm Springs, California. His first marriage, to Dorothy Ames, ended in divorce in 1957. Mr. Kimball who was named Secretary of the Navy by President Truman on June 28, 1951, rose to that post through a career that encompassed flying, business and politics. As a Second Lieutenant in the Army Air Corps in 1918, he piloted pursuit planes and was mustered our as a First Lieutenant at the end of the war. Moving to California in 1920 be began a long career with the General Tire and Rubber Company of Akron, Ohio, where he joined its sales department in Los Angeles. Eventually be became the company’s manager for 11 Western states, vice president and director. He also became executive vice president and general manager of the Aerojet Corporation. In politics, Mr. Kimball was a middle-of-the-road Democrat who solicited funds from friends for President Truman in 1948 when Mr. Truman won his upset victory over Governor Thomas E. Dewey of New York,. In 1950 he toyed with the idea of opposing James Roosevelt for the Democratic nomination for Governor of California, but dropped out when he concluded that no Democrat could beat the Republican candidate, Earl Warren. Mr. Kimball was one of the country’s few industrialists to support Harry Truman in the 1948 bid for re-election. His support of the Democratic Party led to his appointment, in February 1949, as Assistant Secretary of the Navy for Air. Mr. Kimball, who held a private pilot’s license and flew his own plane, was the first former Air Corps pilot to head aviation in the Navy. Dan Able Kimball was born in St Louis on March 1, 1896. After attending public schools there and taking several correspondence courses, he joined the aviation section of the Army Signal Corps in 1917. As an Air Cadet at ground school in Berkeley, California, he was a classmate of James H. Doolittle, who in 1942 was to lead a carrier-based air raid over Tokyo and who later became an Air Force General. The two young aviators also went through flight school together at Rockwell Field, San Diego. As director of Aerojet at Azusa, California, a General Tire subsidiary that manufactured jet-assisted take-off equipment, Mr. Kimball was in charge of the development program. Under his direction, Aerojet cooperated with the Douglas Aircraft Company and other manufacturers to develop high-altitude rockets for the purpose of obtaining data 100 miles or more in space. Mr. Kimball went on leave from his industrial activities in 1949 after President Truman named him Assistant Secretary of the Navy for Air. He began his career in the Navy Department in the midst of a controversy in which the Navy opposed the restricted role assigned it as a result of the armed force unification plan. One of Mr. Kimball’s first public statements was an affirmation of the important future that lay ahead for Navy aircraft carriers. Before he became Secretary of the Navy, Mr. Kimball has served as Under Secretary, and in both roles was responsible for directing the large expansion of the Navy after the outbreak of the Korean War.